Included case studies illustrate effective application of the concepts and methods described, providing both practicing public and nonprofit managers and public policy/administration students with insight into these emerging strategic alliances. 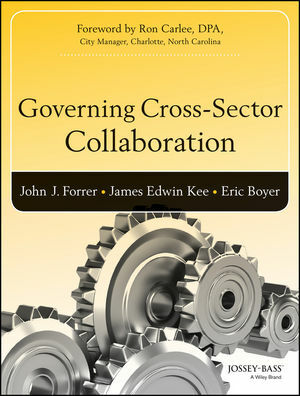 The first comprehensive guide to public governance collaborations, Governing Cross-Sector Collaboration is an important and timely contribution to the field of public management. James (Jed) E. Kee is Professor of Public Policy and Public Administration in George Washington University's Trachtenberg School of Public Policy and Public Administration. He holds a BA (History and Political Science) from University of Notre Dame; MPA and JD from New York University. Kee has had an extensive career in state government administration in New York and Utah. He was counsel to the New York State Legislature and served under two Utah governors as state planning coordinator, state budget director, and executive director of the Department of Administrative Services. His publications include "Out of Balance" (with Scott Matheson, 1986); "The Crisis and the Anticrisis Dynamic: Reshaping the American Federal System" (1992) in Public Administration Review, and "Benefit-Cost Analysis", in Handbook of Practical Program Evaluation. John Forrer is Associate Director of GW's Institute for Corporate Responsibility and Associate Research Professor of Strategic Management and Public Policy. Prior to that he was Director of GW's Center for the Study of Globalization and Executive Director of the Institute for Global Management and Research (IGMR). He has an MPA from Syracuse's Maxwell School of Citizenship and Public Affairs. His recent publications include "Public-Private Partnerships and the Public Accountability Question" (Public Administration Review), "Not Your Father's Pulic Administration" (Journal of Public Affairs Education), and "Privitization and Organizational Change: Lessons from Cross-National Research" (The International Journal of Business and Public Administration).